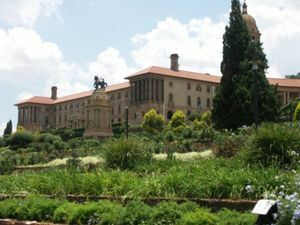 Pretoria, the administrative capital of South Africa, is in Gauteng. Pretoria was allegedly occupied by the Sotho people for many centuries. During the 15th century the Ndebele people also migrated into the area and settled along the banks of what is today called the Apies River. Around 1820 the Matabele under the leadership of Mzilikaza also entered the region, leading to local conflicts between the Matabele newcomers and the already established Sotho and Ndebele tribes as well as the European Voortrekkers who were steadily moving northward through the country. These conflicts came to an end when the Matabele were defeated by the Voortrekkers in 1837 at Mosega. By 1855 there was no known tribe in what is known as Pretoria area today. Only nomadic groups passed through this area, with a leader/person Tshwane (so it is alleged) one of the them. Pretoria was founded in 1855. 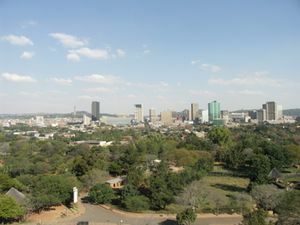 Initially the capital of the Zuid-Afrikaansche Republiek was Ohrigstad, but Pretoria became the capital of the then ZAR. 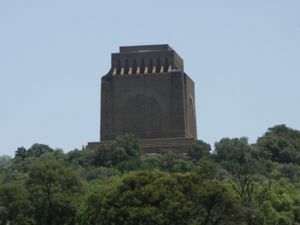 Later on Pretoria became the capital of the Transvaal province (old ZAR) after the Anglo-Boer War. The city was named after Andries Pretorius, the boer leader at the Battle of Blood River where the Voortrekkers defeated the Zulus under King Dingaan. In 1856 the area today know as Arcadia was acquired in exchange for a pony and added to the town. In 1899, during the Anglo-Boer War, Winston Churchill was captured and held as a POW in Pretoria until his eventual escape to Mozambique. British forces captured Pretoria in 1900 and held control over the city until the signing of the Peace of Vereeniging treaty in 1902. When the Union of South Africa was established in 1910, Pretoria was elected the capital and is still the administrative capital of the Republic of South Africa today. Pretoria is located in a summer rainfall area with hot days regularly followed by short and intense afternoon thunderstorms. The thunderstorms are often accompanied by lightning and occasionally result in hail. Summer temperatures range between 16°C at night to 30°C during the day. Winters are mild and dry with temperatures averaging between a minimum of 5°C and a maximum of 20°C. Five highways join in the Gauteng region, making it accessible from all cities in the country. This would include the N1, N3, N4, N12 and N14 national highways. Most National Routes (N)  are now Toll Roads or will be in the not to distant future. Major bus companies like Greyhound, Translux, Intercape Mainliner and the BazBus offer connections to all big cities in South Africa. 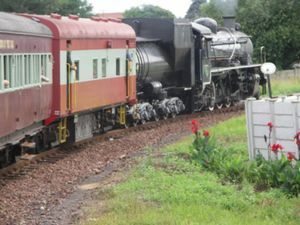 There are two suburban rail options from Johannesburg. First, there is Gautrain which goes to Pretoria in 35 minutes at a price of R49 (plus R11 for the mandatory Gautrain Gold Card). The other network is MetroRail which takes a detour via Germiston and Kempton Park and stops far more often, resulting in a travel time of 1 hour 40 minutes. It only costs R9 though. Gautrain buses serve local routes from the different stops in Pretoria. Pretoria train station is on the corner of Andries and Railway streets, just south of the city centre. The Shosholoza meyl service runs to Johannesburg (south), Polokwane, Musina (north), Witbank, Nelspruit and the Mozambique border (east). 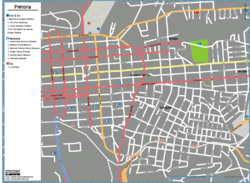 By South African standards Pretoria is reasonably well served by public transport. Minibus taxis (aka combis) are the most common form, and are mostly the new, larger variety, costing R12 a trip and going to most parts of the city, even running at night time on the main thoroughfares. Best tell the driver where you want to go and he should be reasonably honest in whether he is going in that direction. Gautrain feeder buses  run limited routes in the city, costing R20 a trip and needing you to buy a prepaid Gautrain card beforehand. As of January 2011 the Tourist Hop on/Hop Off bus has been suspended. The tourist office had no information on when or if it would return. Either use a taxi, rent a car, use the municipal bus service or, if you really must, use the minibus taxis. Walking after dark is definitely not recommended in the CBD, but with a little common sense a 1km walk from a suburban mall to your guesthouse is doable unless you are a lone female. There are also many smaller, local shopping centres usually with one of the larger chain stores as an anchor. The renowned restaurants include Cynthia's, The Hillside Tavern and Pachas. There are also many franchised diners throughout the city. 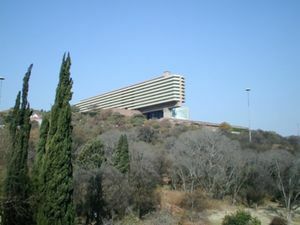 Pretoria's nightlife is concentrated in Hatfield (near the university), which boasts a number of bars and night clubs. Menlyn Square (just off the Menlyn shopping centre) is also a popular location which contains several venues but caters for the more upmarket crowd. Being the capital, there are several posh hotels including the Sheraton, most of which are in the Central Business District. However, the CBD is not a particularly good place to base yourself given the city centre is pretty quiet and menacing at night. In response there are literally 100s of small guesthouses and bed & breakfasts spread all over the suburbs, which, whilst not being particularly African, are comfortable and safe places to stay. The hotel chains often have one or more hotel in town, with so many hotels owned by the same chains, in particularly Southern Sun, and occasional change of ownership (e.g. a Holiday Inn is now a Southern Sun) things can get a bit confusing. Make sure you note the address when booking so you go to the right hotel. When Parliament is in session and when there are other state events it can be almost impossible to find a mid-range or splurge room. Consider nearby Centurion as an alternative if you have to be in Pretoria at those times. Complete GSM coverage with GPRS, 3G and HSDPA and Edge available almost everywhere. Always-On  , +27 (0)11 575-2505, provides prepaid WiFi access in a number of locations in and around Johannesburg. Simply connect to the access point and you will be given the opportunity to pay for access by credit card. Pricing starts at around R15 for 10 minutes or R60 for 100 MB. Pretoria is considered to be a relatively safe city by South African standards and violent crime against tourists is somewhat rare. That said, basic common sense should still be used. Avoid walking around after dark, even in a group. The city centre becomes deserted after nightfall, so it would not be wise to hang around at these times. If you are cycling around the Hatfield shopping area (Hatfield Plaza), there have been cases of beggars asking for a ride from approaching cyclists (especially if you are walking with the bike). As this area is busy with shoppers, students, tourists, police and car minders there is very little chance of any real trouble happening, but it can be annoying and daunting for tourists as the beggars are quite insistent. That said, the Hatfield area is usually perfectly safe. In case of trouble, here are important telephone numbers. Irene is a small town to the south of Pretoria with a day spa and a dairy farm. Rietvlei Nature Reserve, a small and quiet nature reserve with a number of wildlife species and lots of bird watching opportunities. Visit Hartebeespoort Dam. There are hot air balloon rides over the Savanna, a cable car, a golf course and watersport. This page was last edited on 23 September 2018, at 10:10.